The dog refuses to hunt on Sabbath and will not eat pork. All the villagers raced to the airstrip, singing and dancing, when mission pilot Gary Roberts landed at Suminka, a remote village in the Indonesian province of Papua. It had taken the villagers 10 years to cut down the trees by hand to clear the way for an airstrip at their mountainous village, and Gary’s mission plane was the first to land. This was a big event. The villagers had seen the three angels’ logo on the airplane’s tail. Gary was surprised. He hadn’t expected people in Suminka, a village previously accessible only by a long trek by foot, to have heard about the Adventist Church. The villagers soon told him that many of them were keeping the Sabbath. The reason, they said, was because of a Seventh-day Adventist dog. The story started several years earlier just across the border, in Papua New Guinea, when an Adventist pastor, Moses, and a lay pastor named Darius had the same dream on the same night. A few days later, the two men set off on the three-day hike to Suminka. Arriving at the village, they announced evangelistic meetings would be held every evening for a week under a tree on the far side of the village. But the day of the first meeting, Pastor Moses fell ill with malaria. He was terribly sick, and the villagers predicted that he would die. All day Pastor Moses was sick. But at 5 p.m., he suddenly felt better. He took a bath and preached. Afterward, he fell very ill again. This happened all week. He was sick until 5 p.m.; recovered, took a bath and preached; and then sank back into bed. At the meetings, he told the people about the Sabbath and cautioned against easting unclean meat such as pork. Wild pigs are a popular dish in the Papua mountains. When the week ended, Pastor Moses made an appeal. No one come forward. Pastor Moses and Darius returned home deeply disappointed. They wondered why they had had the dream without any results. Back at Suminka, life resumed as normal — until Saturday morning. The village’s best hunting dog, Dolby, got up and headed down the trail. Its owner and other villagers thought it was onto something, so they followed. The dog went to the tree where the missionary had spoken and sat down. The villagers thought that was strange. The next Saturday, the same thing happened again. The dog got up, walked over to the tree, and sat down. It refused to hunt on Saturdays. The villagers noticed that the dog had stopped eating pork. It refused to hunt for wild pigs and other unclean animals. “If he worships on Sabbath, we should, too,” said another. Gary, the mission pilot, was excited when he heard the story, and he later called Pastor Moses. The pastor was some distance away from Suminka, so he contacted Darius and told him to plan on spending a year at the village, teaching the people about Bible truths. Today, about half of the village of 200 adults and children worship on Sabbath, and 21 people have been baptized. Dolby continues to shun unclean food. 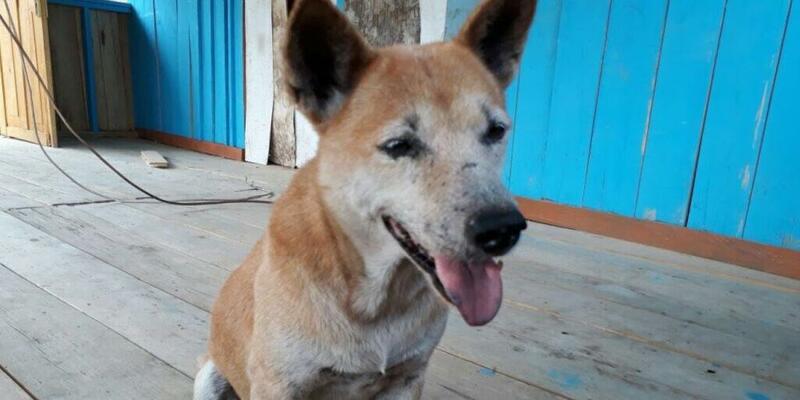 Villagers say he is a very healthy dog. Your mission offering helps missionaries like Gary share the good news about Jesus’ soon coming with people around the world. Thank you for your mission offerings. Banker Asks God to Reveal Bible and His Church Brazilian says God answered the prayer more quickly than any other prayer in his life. March 31 - After The Fire As the flames burned their only church on campus, students and faculty wondered why such a terrible thing would happen to their small place of worship.